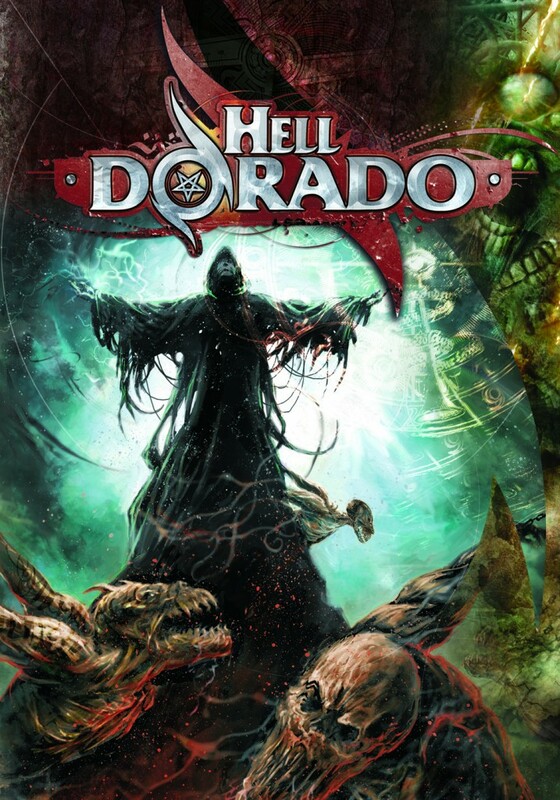 While this may be the first time many of you have heard of Hell Dorado it’s actually been around for several years now. Lets take a closer look at this game system. I myself have been ogling the minis off and on for quite a while now but never seized the initiative and made a purchase. You see no one else I knew was willing to commit to playing a game that wasn’t officially distributed outside of Europe. In 2009 it looked like I’d never even get the chance; Asmodee France announced it would no longer be publishing the game. Apparently it just wasn’t making enough money for the board game company. But a miniatures line like this couldn’t go to waste, and American publishers Cipher Studio, makers of Anima Tactics, snatched up the rights and the molds they needed to keep the game in print. And that brings us to where we are now. The first copies of the Hell Dorado rulebook have arrived from the printers, and I couldn’t be happier to have gotten my hands on a preview copy. So here’s the scoop. 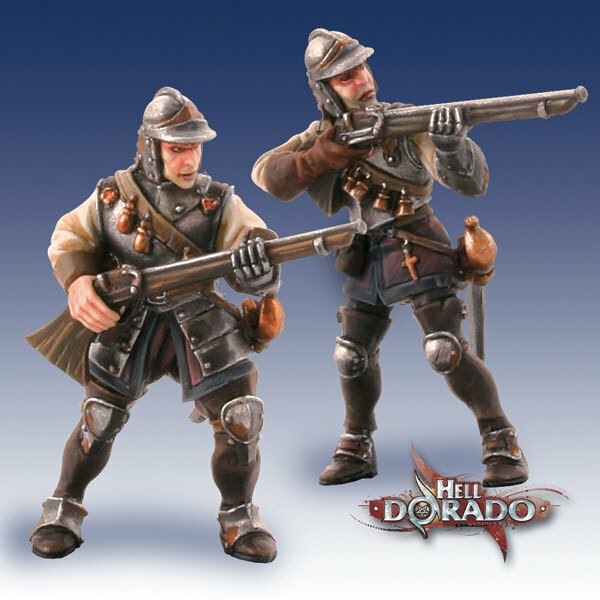 The Setting: One of the most interesting things about the Hell Dorado world is that much of it is based on actual world history and real historical figures. The setting as we know it begins near the close of the Thirty Years War, when the horrific violence of the Sack of Magdeburg triggered the opening of an otherworldly portal. It wasn’t long before the first brave souls to venture through had to accept the inevitable truth: this was hell. In light of the magnitude of this discovery, the Europeans put aside their differences and now Catholic fights alongside Protestant. But the Europeans weren’t the first visitors to Hell; the Saracen Empire already had colonies in the underworld having created their own portal centuries before using their advanced understanding of alchemy. They had already spent centuries exploring this land in their quest for a greater understanding of the divine while harvesting Hell’s supernatural resources to fund their expeditions. In fact it was their armies that had cleared the demons from the lands around the European foothold. With only scattered bands of demons left to contest them, the Europeans were able to found a city in hell: New Jerusalem. They use this city as a base of operations while they send forth expeditions to exploit the supernatural resources of Hell and just maybe find some spiritual enlightenment. Meanwhile the Demon occupants of Hell are too divided to organize a meaningful resistance against the armies of invaders that pour into Hell each day. For centuries demon kind has spent their time warring on one another so that their arch demon masters might have more territory. The arrival of newcomers has changed this very little. Only a few demons and fallen angels have actively organized fighters to challenge the humans. The Demons must also face a threat from their own kind. Another set of demons known collectively as The Lost have abandoned their former masters to fight for their own place in Hell. All this fighting means there’s plenty of room for mercenaries to make a living helping any of these factions slay their rivals. 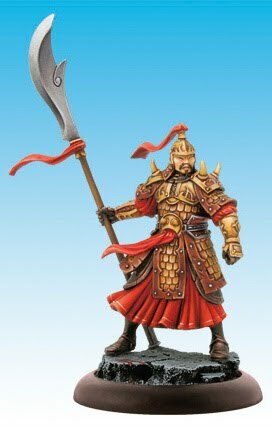 Finally, there are the Immortals of the Qin Empire. This nation of damned souls has united with a powerful renegade demon lord. A creature who seeks to redeem their souls rather than have them simply suffer eternal torment. They must defend their lands like any other in possession of one of Hell’s domains. 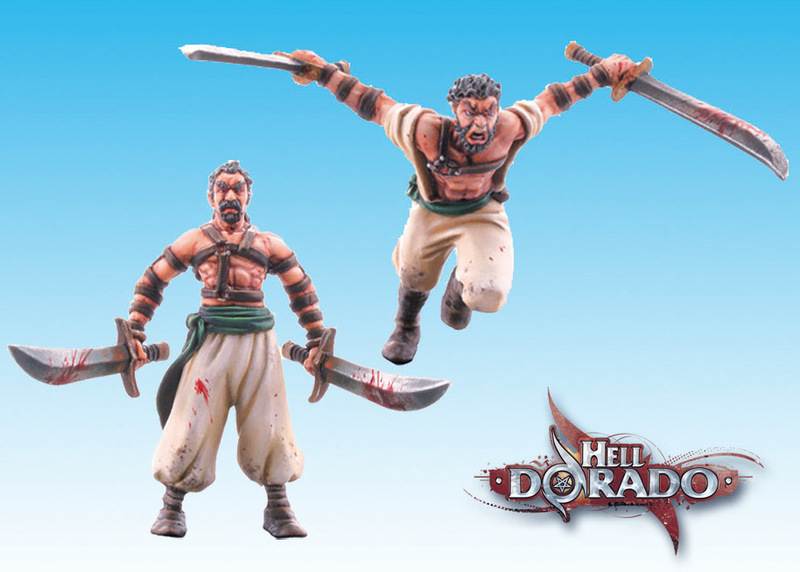 Gameplay: Your force in Hell Dorado will typically consist of 8 to 12 models which represent a small exploratory Company. This group of fighters will be based around your force’s leader, or Officer. All Officers are named characters with unique stats, equipment, and sets of abilities. While you will sometimes have two different versions of a trooper model to choose from (Halberd or Dagger versions for example) you can’t customize your equipment any more than that. In addition to their stat-lines each model has at least a few special rules to give them more tactical depth. 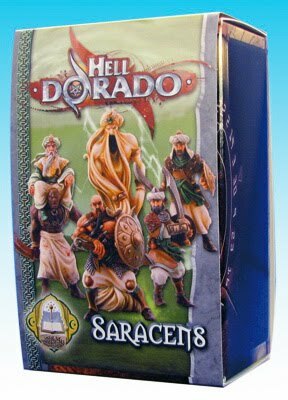 Like so many skirmish games, Hell Dorado has an alternating activation system. You activate one of your models, then your opponent activates one of theirs. When a melee attack sequence is initiated, models on both sides get to make their attacks. This means the game plays rather quickly and you must be sure the odds are in your favor before you go charging in. Attacks, both ranged and melee are made by rolling a number of dice equal to your attack statistic. Any dice that roll higher than your target’s defense score hits. A chart supplied on each miniature’s card indicates the amount of damage scored per number of hits, as well as any additional effects that the attack may cause. Subtract the target’s protection from the damage shown on the attacker’s chart, and the difference is the damage you inflict. To make things more interesting, the game has a nice resource mechanic involving Command Points. At the start of the game, you tally the number of Command Points your army gets by adding the Command stats of Officers and Independents to the number of trooper models in your army. You spend these points to give different models in your army “Orders” which basically translates into them doing something cool and useful. In addition, all officers can use the “Vae Soli” and “Vae Victus” orders, which allow you to activate a model immediately or give a model +2 to their shooting or combat statistic. Some orders may require a model’s whole activation to trigger, and other order’s may be usable even outside a model’s activation. Your Command Points are recalculated at the start of every round to account for losses your army may have suffered. Some orders are considered so powerful that they use “Permanent Command” which will be deducted from your Company’s Command total whenever it is recalculated. The supernatural nature of the Hell Dorado setting manifests itself in two big ways: the infernalist and mentalist abilities. Mentalists possess unnatural auras with various helpful or harmful abilities. Some may require an order to use, and others may be permanently active. Infernalists practice an interesting form of demonology that they use to transform Lemures (a catch all used to describe the verminous creatures that are omnipresent in Hell’s ecology) into walking weapons. After feeding the tiny creatures the proper elixir needed to elicit the desired result, the Infernalists set them loose to attack the enemy and release the spell contained within. So what are my personal thoughts? I’ve already said I love the minis; enough that I’d buy them and give the game a try even if the rulebook was written in Crayon. But its not… the rulebook is laid out well and I was able to figure out the rules very easily. Its got a lot of great art and a good sense of design. It does have an unfortunately high number of little typos, but they didn’t interfere with my understanding of the gameplay being mostly restricted to the fluff sections. There are a few things in particular I liked at first glance. I like the fact that I get to roll a little handful of dice when I attack. I like the original way that they worked magic into a pseudo real-world setting through the use of the Lemures. I like all the cool combos and buff stacking going on in this game, and I always find systems with those sorts of mechanics to be the most fun. In addition the fluff was a pretty great read. I found myself particularly enjoying the sections on the Lost and the Immortals. ~ So now I just have to play a game. The plan is to paint up Westerner and Saracen forces which you will be seeing on BoLS at some point in the future – assuming I can stick to those factions. 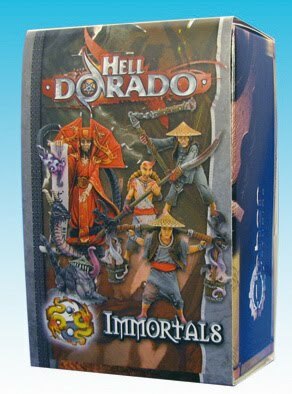 And if anyone out there has a few (or more) games of Hell Dorado under their belt, I want to hear your thoughts about the game in the comments section. For those of you who are already fans, feel free to ask for spoilers. While I’ve always been intrigued by the minis the game itself is still very new to me so I just don’t know what little tidbits from the book people are dying to hear about.